Any outdoor activity comes with potential small threats—things like sunburns, stormy weather, poison ivy, or twisting an ankle! But what about those yellow and black striped flying insects that we see? What are those things? Your first guess might be “It’s a wasp! I don’t want to get stung!” and while it might be a dangerous wasp, it could be something else. We’ve written up this short guide to all things flying, striped, and bi-colored yellow and black! Read below about the most common bees, wasps, and impostors that you might see while you are out for a hike. We’ve listed them alphabetically and included some photos so that you can best identify that creature! Can they sting? Yes, but they are not aggressive. These bees have distinct markings. Males have a green head with a black and yellow striped body. Females are less colorful, being mostly just green. These bees nest in the ground, but are attracted to sweat (hence the name) and will land on sweaty exposed body parts (arms and legs). Easily identifiable by their large, fuzzy bodies, bumblebees are some of the best pollinators that exist in our forests and gardens. They seek out rich nectar and can often be seen carrying visible pollen on their legs. If you see a bumblebee, let it alone! Not only will they ignore you, but they are a population in decline that needs protection and they are important for pollination of plants that birds and wind cannot help. Can they sting? Yes, and will when highly threatened. Human attacks are rare. As the name implies, these bugs feed on cicadas. They are identified by large black bodies with 3 partial yellow stripes across the back. Cicada killers are wasps and not bees, they nest in the ground. If you find a nest in your yard on the ground, avoid the area. Stepping on the nest may agitate the wasps and they may sting in defense. These are the most common bees that you will see in North America. They are large, fuzzy, and have a single band of yellow around the waist. They have a black head with yellow hairs on the thorax and they are loud. Like the American Bumblebee, these creatures are so important for pollination so leave them be! Can they sting? No, they can’t hurt you. These bees are identified by a large black head and a yellow thorax. They have strong jaws, allowing them to cut into wood, such as a shed or fence. When threatened, they will fly aggressively around the threat in an attempt to scare it away, however they cannot sting. Not a bee, but a bee-utiful butterfly! Not all yellow and black striped flying creatures are scary! Can they sting? Yes, their stingers contain venom and can sting multiple times. This is an insect you want to avoid! Yellowjackets are wasps, who nest in the ground and are highly defensive. Yellowjackets are attracted to sweet substances, like candy or soda, so be careful when enjoying beverages outdoors (don’t get stung on the lip). Do not physically attack these creatures. When attacked, yellowjackets release a pheromone that signals to other yellowjackets to come help attack the threat. Your single opponent battle will soon become multiple yellowjackets and potentially dangerous. Walking (or running) away from a yellowjacket is the best defense. Download our FREE trail chart—19 of the best hikes in the Blue Hills detailed for you! Can they sting? Males cannot sting (they have a large fake stinger), however females can sting. These are medium sized wasps with full length stripes. Males tend to have white and brown wings, while females have orange wings. These wasps lay eggs on beetles, and the offspring will eventually eat the beetle. They are typically found in gardens and meadows. Flower Fly & Hover Fly. Can they sting? No, they are harmless. These harmless wasp look-a-likes can neither bite nor sting. They have large eyes, like a fly, making them easily identifiable compared to real wasps and bees. Can they sting? Yes, however they are not aggressive and will lose the stinger and often die after. Honey bees can be either worker bees, drones, or the Queen bee. These bees are a mainstay of the ecosystem as we know it. They create hives out of wax and live in large colonies. These bees are critically important, please do not disrupt them or swat at them! Can they sting? Yes, if provoked. They can sting multiple times. Paper Wasps prefer to nest in wood, such as a shed or fence or a pile of firewood. They are social dwellers and will defend their home to intruders, so be careful if you have a nest in your shed or barn. However, if you like to garden, these wasps are great at removing unwanted caterpillars from your crops! Can they sting? Yes, but rarely does. 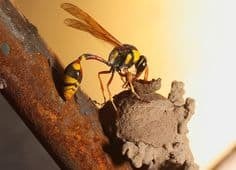 These wasps build nests that look like ceramic pots, using mud and twigs to build structure. They typically prey on spiders, beetles, and caterpillars. Can they sting? No, they have no stingers but will deliver a painful bite if caught. Robberflies look similarly to yellowjackets, but they only show aggression towards other insects, including yellowjackets! They are easily identified by their bright yellow and black markings, and their signature “beard” on their face. They have a black thorax with two yellow “eye” markings in the middle. Don’t be afraid of these flying insects! Now that you have the knowledge about some of the flying insects to avoid (and some to ignore), download our free chart to the Blue Hills, where you can learn about 19 of our favorite hikes in the Blue Hills! 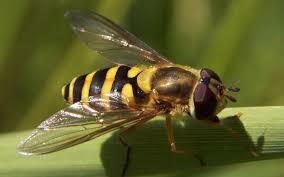 Let us know if you see any yellow and black striped flying insects while you are out!